A palapa (a Spanish word of Tagalog origin, meaning "petiol of the palm leaf") is an open-sided dwelling with a thatched roof made of dried palm leaves. It is very useful in hot weather and, therefore, very common on Mexican beaches and deserts. It is perhaps one of the most important architectural contributions of West Mexican culture. Palapas are also common in Honduras and other Central American countries. 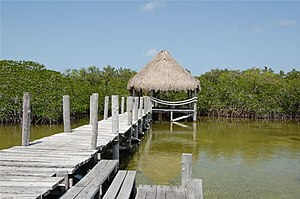 Chickee - the Creek/Seminole word to describe an open dwelling with a palm thatched roof frequently constructed by Florida's Indians. Manila Galleons — Spanish Colonial Mexico and Spanish East Indies trade/cultural exchange route. ^ "Pilipinas". Pilipinas. Honolulu, Hawaii: Philippine Studies Committee, Southeast Asia Council, Association for Asian Studies (39–43): 31. 2002. It is interesting to note that palapa is listed in the American Heritage Dictionary which considers the word to be of American-Spanish origin. However, we could ultimately trace the roots of the word to the Philippines. Palapa (Tagalog) refers to an opensided structure with thatched roof made of dried palm fronds, usually found on beaches and used as shade.